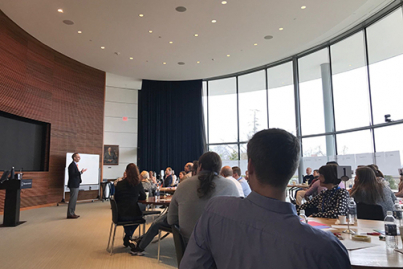 This new certificate program is being held in a study tour format with the prestigious Yale School of Management in New Haven, Connecticut on April 7–11, 2019. 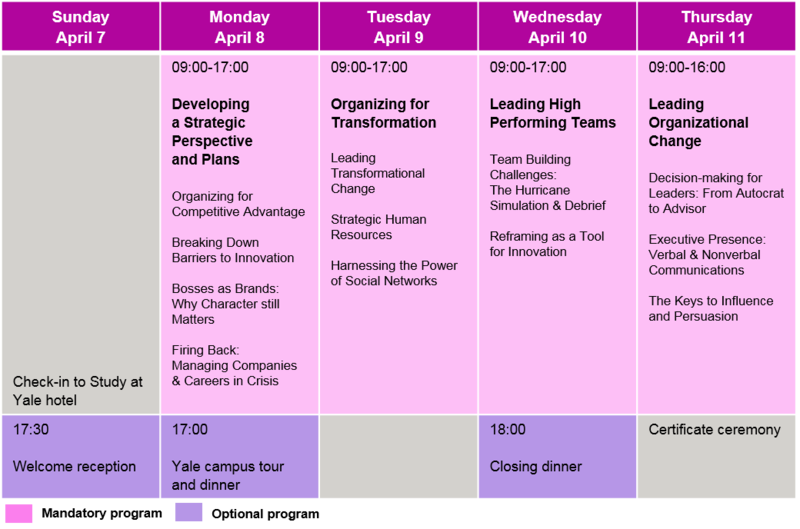 This Study Tour is open to current Aalto Executive MBA, Aalto MBA and Global Leader program participants and alumni. The Leading Strategic and Transformational Change program will help you further develop your strategic thinking and lead successful transformational change in your organization. 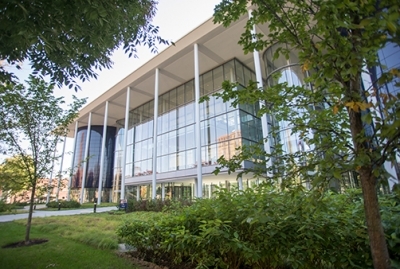 The program consists of four full days of learning with world class faculty with a combination of interesting pre-work materials and a leadership assessment, interactive classroom discussions, workshops, case studies and extracurricular activities and events to facilitate networking among participants and faculty – as well as post-program engagement opportunities with Yale. At the end of the program, each participant will be awarded a certificate of completion signed by the Dean of the Yale School of Management and the Associate Dean of Executive Education. The Study Tour also counts as an elective module (4.5 EC) for current Executive MBA, MBA and Global Leader participants. Develop your strategic thinking in order to lead successful transformational change at your organization with speakers from across Yale University’s graduate schools and centers for research. Pre-readings and cases, leadership assessment, highly interactive discussions, workshops and simulations ensure content is learned, practiced and retained. Since its founding in 1701, Yale has been dedicated to expanding and sharing knowledge, inspiring innovation, and preserving cultural and scientific information for future generations. Experience the best of Yale, with a campus tour, events and meals around campus in historic venues, and networking with peers. Receive a Yale certificate, access to the Yale Executive Education alumni network and social media groups, a monthly applied research newsletter, publications and invitations to on-campus and online alumni events to promote continuous life-long learning. The Study Tour to Yale will take place on April 7–11, 2019, with seminar days from Monday April 8 to Thursday April 11. Aalto EE reserves the right to make changes to the program. The program will take place at Edward P. Evans Hall at the Yale campus, which houses state-of-the-art classrooms, faculty offices and meeting spaces organized around an enclosed courtyard. From here, Yale School of Management students connect and collaborate with their peers across the university and the world. Program participants will stay at The Study at Yale hotel located in the heart of Yale University’s Campus – just steps away from the University’s museums, theaters, libraries and cultural centers. Hotel stay for four nights April 7–11, 2019 is included in the program fee. James Baron is Willian S. Beinecke Professor of Management Professor at Yale School of Management. Professor Baron’s research interests include human resources; organizational design and behavior; social stratification and inequality; work, labor markets, and careers; economic sociology; and entrepreneurial companies. James Baron has a PhD from University of California. Rodrigo Canales is an Associate Professor of Organizational Behavior at Yale School of Management and a member of the advisory board of the Dalai Lama Center for Ethics and Transformative Values at MIT. He does research at the intersection of organizational theory and institutional theory, with a special interest in the role of institutions for economic development. Specifically, Rodrigo studies how individuals are affected by and in turn purposefully change complex organizations or systems. His current research is divided in three streams. The first focuses on the structural determinants of the quality of startup employment. The second explores the conditions under which development policies and practices are built upon and incorporate existing, rigorous evidence. The third explores how to build effective, resilient, and trusted police organizations in Mexico. Rodrigo Canales has an MBA and PhD from MIT. Zoë Chance is an Assistant Professor of Marketing at Yale School of Management. At Yale she teaches one of the school’s most popular electives, Mastering Influence and Persuasion. Zoe delivers keynotes and influence workshops internationally and works with Fortune 500 firms and leading nonprofits. Her research has been published in top academic journals, and covered in media outlets like The New York Times, The Wall Street Journal, The Economist and the BBC. In 2017, Thinkers50 named Zoe one of the top global management thinkers to watch. Prior to Yale, Zoe managed a $200MM segment of the Barbie brand at Mattel, and acted on stage and film. Zoë Chance has a PhD from Harvard Business School. Jeffrey Sonnenfeld is Senior Associate Dean of Leadership Programs as well as the Lester Crown Professor in the Practice of Management for the Yale School of Management, as well as founder and president of the Chief Executive Leadership Institute, a nonprofit educational and research institute focused on CEO leadership and corporate governance. Professor Sonnenfeld's related research has been published in 100 scholarly articles which appeared in the leading academic journals in management. He has also authored eight books, including The Hero's Farewell, an award-winning study of CEO succession, and another best seller, Firing Back, a study on leadership resilience in the face of adversity. Jeffrey Sonnenfeld has PhD from Harvard University. Olav Sorenson is Frederick Frank '54 and Mary C. Tanner Professor of Management at Yale School of Management. Professor Sorenson's research interests include economic geography, economic sociology, entrepreneurship, organizational ecology, the sociology and management of science and technology, and business and corporate strategy. His most extensive line of research examines how social networks affect transactions, thereby shaping the geography and evolution of industries. Olav Sorenson has a PhD from Stanford University. Amy Wrzesniewski is Michael H. Jordan Professor of Management at the Yale School of Management. Professor Wrzesniewski's research interests focus on how people make meaning of their work in difficult contexts (e.g., stigmatized occupations, virtual work, absence of work), and the experience of work as a job, career, or calling. Her current research involves studying how employees shape their interactions and relationships with others in the workplace to change both their work identity and the meaning of the job. She received her PhD from the University of Michigan. Flight arrangements are to be made independently. An optimal flight would arrive in New York midday to early afternoon of Sunday April 7 allowing participants to take part in the Welcome reception at Yale on Sunday at 5.30pm. The program on Thursday April 11 will end by 5pm. More information on transportation between the airport and New Haven can be found from Yale's Plan a Visit webpage. We will research the possibility for joint bus transportation from and to the airport after registration closes.